If you’ve been reading Free Liberal all these years, you know that Dr. Carl Milsted has been a big influence on our direction and concept. He’s collected his wisdom from holisticpolitics.org in the form of a new e-book. 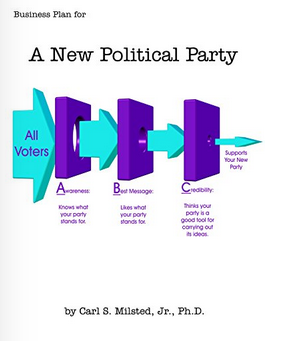 Carl calls it Business Plan for a New Political Party, but even if you aren’t interested in forming a new political party there is a lot of strategy and policy for any politically-interested person to think about. What solutions haven’t even been considered? Are there new political alignments possible if fertile common ground exists? Can systems thinking trump partisan bickery? I’m still reading it, so more soon. Kevin Rollins is the founder and editor of Free Liberal and principal of Kevin Rollins Consulting. He was formerly the managing editor of Econ Journal Watch. He holds a master’s in economics from George Mason University.